A female ‘religious leader in chief’? Most Americans say the nation is ready for a female president, but is the country ready for a woman to take on the traditional presidential role of comforter, inspirer, moral voice and quasi-spiritual leader? In a country where women’s leadership roles in religion are hotly debated, opinions may differ sharply. Women’s leadership roles and scriptural references to them have been discussed and debated for decades as some denominations have expanded opportunities for women to lead and others have limited them. While presidents are not religious leaders, they frequently have invoked religious language and values. How would Americans’ views of a female president and Americans’ views of female religious leaders influence each other? The majority of senior megachurch pastors are male, according to research from the Hartford Institute for Religion Research. Read the research report. Read an undated explanation of why the Southern Baptist Convention’s Faith and Message was revised in 2000 to say, “While both men and women are gifted for service in the church, the office of pastor is limited to men as qualified by Scripture.” The explanation was written by the executive committee of the SBC, the largest Protestant denomination in America. The Roman Catholic Church says its doctrine that only men can be priests is infallible, which in Catholic teaching means that it is irreversible and without error. See a Nov. 19, 1995, New York Times story about the statement, issued with then-Pope John Paul II’s approval by the Vatican’s Congregation for the Doctrine of the Faith, which was headed at that time by Cardinal Joseph Ratzinger, who is now pope. A January 2006 CBS News/New York Times poll found that 92 percent of Americans said they would vote for a qualified woman for president, and 55 percent said America is ready for a women president. Read the poll. Read a June 12, 2009, CBS News story that notes that Gallup Polls found that 52 percent of Americans said they would support a woman for president in 1955, 73 percent in 1975 and 82 percent in 1987. The Pew Forum on Religion & Public Life provides a resource page on religion and politics. It includes links to relevant surveys and news items. Sue Crawford is a professor of political science and international relations at Creighton University in Omaha, Neb. One of her specialties is the role of religious institutions in public policy. She co-edited Christian Clergy in American Politics and co-authored Women With a Mission: Religion, Gender and the Politics of Women Clergy. Melissa Deckman is professor of political science and public affairs at Washington College in Chestertown, Md. Her specialties include religion and politics and women and politics. She wrote School Board Battles: The Christian Right in Local Politics (Georgetown University Press, 2004) and “Christian Right School Board Candidates” for the Encyclopedia of American Religion and Politics (Facts on File, 2003) and co-wrote Women With a Mission: Gender, Religion and the Politics of Women Clergy. Contact: mdeckman2@washcoll.edu, 800-422-1782 ext. 7494. Laura Olson is a professor of political science at Clemson University in Clemson, S.C., and is also an expert on women and gender in religion. Her books include, as author, Filled With Spirit and Power: Protestant Clergy in Politics and, as co-author, Women With a Mission: Religion, Gender and the Politics of Women Clergy. She is also co-author of a paper on mainline Protestant congregations and homosexuality. Katie Geneva Cannon is president of the Society for the Study of Black Religion. She was the first black woman ordained in the United Presbyterian Church (U.S.A.), and she is Annie Scales Rogers Professor of Christian Ethics at Union Theological Seminary and Presbyterian School of Christian Education in Richmond, Va. Her areas of expertise are womanist theology, women in society and religion and Christian ethics. She wrote the book of essays Katie’s Canon: Womanism and the Soul of the Black Community and Black Womanist Ethics (Continuum International, 1997). Jacquelyn Grant is Callaway Professor of Systematic Theology at the Interdenominational Theological Center in Atlanta, where she founded and directs the Center for Black Women in Church and Society. She wrote White Women’s Christ and Black Women’s Jesus: Feminist Christology and Womanist Response (American Academy of Religion, 1988). She is also assistant minister at Victory African Methodist Episcopal Church in Atlanta. Barbara Harris is a retired Episcopal bishop. Harris was the first female bishop in the Anglican Communion. She is past president of the Episcopal Urban Caucus and has worked on prisoner issues and in other organizations serving the urban poor. She currently is assisting Bishop John B. Chane in the Diocese of Washington, D.C. Contact her through assistant Cheryl Wilburn. The Rev. Eileen Lindner is deputy general secretary for research and planning of the National Council of Churches and senior pastor of the Presbyterian Church at Tenafly in Tenafly, N.J. Previously, she served as the director of the NCC’s Child Advocacy Office. She has written numerous books and articles on a variety of child advocacy subjects. The Rev. Julie Pennington-Russell is senior pastor of First Baptist Church in Decatur, Ga. A megachurch, it is the largest woman-led church affiliated with the Southern Baptist Convention, whose Faith and Message statement states, “While both men and women are gifted for service in the church, the office of pastor is limited to men as qualified by Scripture.” The church is also affiliated with the Cooperative Baptist Fellowship. Emilie M. Townes is professor of womanist ethics and society at Vanderbilt Divinity School in Nashville, Tenn. She is an ordained Baptist clergywoman. She is an expert on Christian ethics, womanist theology, health care and economic justice and is behind the divinity school’s Public Theology and Racial Justice Collaborative program. The Rev. Sharon Watkins is general minister and president of the Christian Church (Disciples of Christ), a mainline Protestant denomination. Women of Faith is a ministry division of Thomas Nelson, Inc., a publisher, producer and distributor of Bibles and books emphasizing Christian themes. YWCA is a non-profit, global membership association run by and for women and their families that advocates peace, justice, human rights, environmental awareness and the rights of women. Contact: worldoffice@worldywca.org, + 41 22 929 6040. Tamara Cohn Eskenazi is co-editor of The Torah: A Women’s Commentary and a professor of Bible at Hebrew Union College-Jewish Institute of Religion in Los Angeles. Dina Najman is rosh kehillah, or “head of the community,” at Kehilat Orach Eliezer Orthodox synagogue in Manhattan, N.Y. She was given the position even though she is not an ordained rabbi; Orthodox Judaism does not ordain female rabbis. Read an Aug. 21, 2006, New York Times story about her. Karen Pechilis is chair and a professor of comparative religions at Drew University in Madison, N.J. She edited The Graceful Guru: Hindu Female Gurus in the United States, which covers the American movements behind Ammachi, Anandamayi Ma, Gauri Ma, Gurumayi, Jayashri Ma, Karunamayi Ma, Ma Jaya Sati Bhagavati, Mother Meera, Shree Maa and Sita Devi. Dr. Nikky-Guninder Kaur Singh is a professor of religion at Colby College in Waterville, Maine, and a specialist on women and Sikhism. Joyce Antler is a professor of American Jewish history and culture at Brandeis University in Waltham, Mass. She has written about images of Jewish women on television and in popular culture. Anthea Butler is associate professor of religious studies and Africana studies and graduate chair of religious studies at the University of Pennsylvania. She is a noted African-American chronicler of the Pentecostal movement. She wrote the chapter “Unrespectable Saints: Women of the Church of God in Christ” in The Religious History of American Women: Reimagining the Past. Cheryl Townsend Gilkes is a professor of sociology and African-American studies at Colby College in Waterville, Maine. She is an expert on black churches. She has written widely, including If It Wasn’t for the Women: Black Women’s Experience and Womanist Culture in Church and Community (Orbis Books, 2000). Sister Mary Ann Hinsdale is associate professor of theology at Boston College in Massachusetts. She is author of Women Shaping Theology. 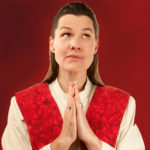 Mary Hunt is co-founder and co-director of the Women’s Alliance for Theology, Ethics and Ritual in Silver Spring, Md. She is a Roman Catholic who describes herself as a feminist theologian. Cynthia Lynn Lyerly is associate professor of history at Boston College in Massachusetts. She has written about women in Southern churches. The Rev. Daisy Machado is Dean of Academic Affairs and Professor of Church History at Union Theological Seminary, New York. She has written about Latina feminist theology, the border, immigrant issues and globalization. Nancy Pineda-Madrid is an assistant professor of theology and U.S. Latino/a ministry at Boston College. Her interests include Hispanic theologies and feminism. Pamela S. Nadell is director of the Jewish studies program at American University in Washington, D.C. She is the author of several books on Jewish women and American Jewish history, including Women Who Would Be Rabbis: A History of Women’s Ordination 1889-1995. She teaches courses on American Jewish history, modern Jewish civilization, Jewish women’s history, the Holocaust and the history of Israel. Maureen Trudelle Schwarz is associate professor of anthropology at Syracuse University in New York and author of Blood and Voice: Navajo Women Ceremonial Practitioners. Beth Wenger is an associate professor of American Jewish history at the University of Pennsylvania and author of The Jewish Americans: Three Centuries of Jewish Voices in America. She wrote the chapter titled “The Politics of Women’s Ordination: Jewish Law, Institutional Power and the Debate Over Women in the Rabbinate” in Tradition Renewed: A History of the Jewish Theological Seminary. Teresa Fry Brown is an associate professor at Emory University in Atlanta. She is author of Weary Throats and New Songs: Black Women Proclaiming God’s Word and God Don’t Like Ugly: African American Women Handing on Spiritual Values. Karim was an assistant professor in the department of philosophy and religious studies at Spelman College in Atlanta. She was reared in an African-American Muslim community. Her expertise is on race, gender and Islam; younger Muslims in the U.S.; and connections and tensions among African-American Muslims and immigrant Muslims in the U.S.
Sandy Dwayne Martin is a religion professor at the University of Georgia in Athens. He has written about women’s roles in African-American denominations. Nancy J. Ramsay is dean of Brite Divinity School at Texas Christian University in Fort Worth, Texas, as well as executive vice president and professor of pastoral theology and counseling. She is ordained in the Presbyterian Church (U.S.A.). Rosetta E. Ross is an associate professor of religion and chairs the department of philosophy and religious studies at Spelman College in Atlanta. An elder in the United Methodist Church, she writes and lectures widely about African-American religion and is treasurer of the Society for the Study of Black Religion. She is an expert on women in the civil rights movement, and she wrote Witnessing and Testifying: Black Women, Religion, and Civil Rights (Augsburg Fortress, 2003). Melissa Snarr is an associate professor of ethics and society and a Christian social ethicist at Vanderbilt University in Nashville, Tenn. Her research focuses on political and religious ethics, social change, religion and war and religion and politics. Catherine A. Brekus is an American religious historian at the University of Chicago Divinity School. She is especially interested in early America and co-wrote a book titled American Christianities: A History of Dominance and Diversity. Deborah M. Gill is professor of New Testament exposition at Assemblies of God Theological Seminary in Springfield, Mo. She served as commissioner of discipleship and national director of Christian education for the Assemblies of God and was senior pastor of Living Hope Church in North Oaks, Minn. She has written articles about women clergy in the Assemblies of God. Riv-Ellen Prell is a history professor and chair of the American studies program at the University of Minnesota in Minneapolis. She is an expert on women in Judaism and is the editor of Women Remaking American Judaism. She says Jews should be concerned with effectively understanding the meaning of change in Jewish life, including intermarriage, falling birth rates and decline of traditional forms of association like synagogues or federations. Mary R. Sawyer was a professor of religious studies at Iowa State University in Ames. She wrote the entry “National Conference of Black Christians” for the Encyclopedia of African and African-American Religions (Routledge, 2001). She has written about women’s leadership roles in the black church. Martha Sonntag Bradley is a professor of architecture and dean of the Honors College at the University of Utah in Salt Lake City. She is the author of Pedestals & Podiums: Utah Women, Religious Authority & Equal Rights and Kidnapped From That Land: The Government Raids on the Short Creek Polygamists (University of Utah Press, 1999). Contact: martha.bradley@utah.edu, kali.korbis@utah.edu, 801-581-3188, 801-581-6889. Rita Nakashima Brock is research professor of theology and culture and director of The Soul Repair Center at Brite Divinity School in Fort Worth, Tex. She has written about feminist theology and Asian-American women. Her books include, as co-editor, the 2007 release Off the Menu: Asian and Asian North American Women’s Religion & Theology. She contributed one of the essays and co-wrote the “Asian American Protestant Women” entry in the Encyclopedia of Women and Religion in North America. Kathleen M. Moore is chair of religious studies at the University of California at Santa Barbara, where she is an expert on Islamic studies, law and religion. She has also studied how “Muslim” has become an identity — and not just a faith — in America. She is the author of a paper on American attitudes toward Muslim immigration since 9/11. Paula Nesbitt is a visiting associate professor of sociology at the University of California, Berkeley. She is the author of Feminization of the Clergy in America: Occupational and Organizational Perspectives (Oxford University Press, 1997). Rabbi Malka Drucker of Santa Fe, N.M., is the author of White Fire: A Portrait of Women Spiritual Leaders in America.